Self-driving the Golden Circle is a popular day trip for visitors to Iceland. The 300 km (190 mi) route covers many beautiful landmarks in a short time, perfect for those on a layover. If you can’t spend a full week driving Iceland’s Ring Road (which circles the entire country), renting a car and driving the Iceland Golden Circle route on your own is a great shorter alternative. What’s the Golden Circle you ask? It’s a 190-mile driving loop from Reykjavik into the southern uplands of Iceland and back. But the best part is you can do the whole trip in a single day. It’s ideal for people on a short layover flying to or from Europe without much time. Self-driving the Golden Circle allows you to travel at your own pace. Stop for photos anytime you want or head off to explore different side roads too. Spend an hour petting Icelandic horses if you want, or wait patiently for the next hot-water geyser eruption to go off! There’s no rush when you’re on your own. Basing ourselves out of Reykjavik, my friend Kiersten and I rented a car to spend the day driving the Golden Circle (Gullni hringurinn in Icelandic) hitting all its best attractions. In this golden circle travel guide I’ll help you get the most out of a self-drive adventure. 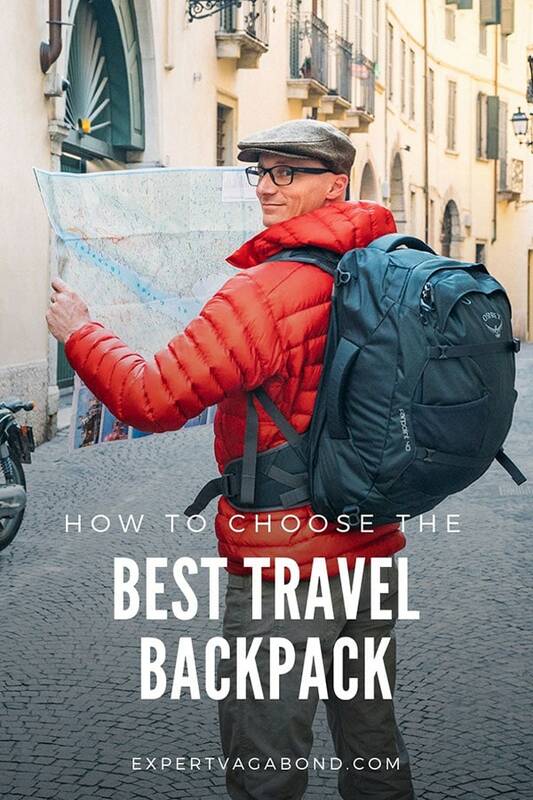 Learn how to prepare, where to stay, and the best things to see on the way! Above you’ll find a map of my itinerary for Iceland’s Golden Circle. Click on the top left of the map to find separate layers marking the route and points of interest. You can hide and show different layers, or click icons on the map to see the names of places I mention in this travel guide. “Star” the map to save it to your own Google Maps, or open the map in a new window for a larger version. Enjoy! Depending on when you’re visiting, driving in Iceland isn’t too difficult if you follow certain guidelines. But the golden circle road is well maintained. 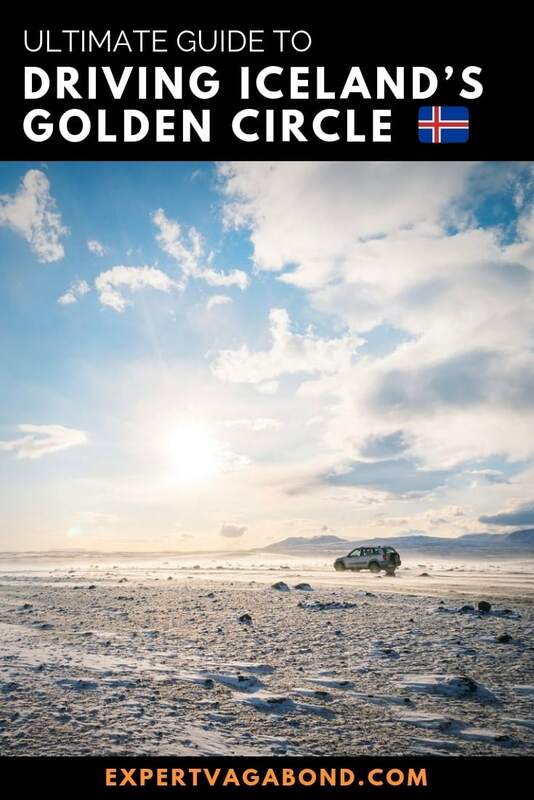 You do not need a 4×4 vehicle to drive the golden circle. As tourism has exploded in recent years, traffic on the popular Golden Circle can be busy during the summer high season. It’s better to get an early start to avoid traffic. In the winter Iceland’s roads are icy. Weather changes quickly, and a sunny morning can easily turn into a snowstorm later that day. But Iceland has a fantastic website to check real-time road conditions called Vegagerdin. Gas is expensive in Iceland at about $2 USD per liter ($7.50 per gallon), however, a full tank should be plenty for the Golden Circle. Some foreign credit cards may need to be charged inside rather than at the pump. Once we left Reykjavik, we started driving the Golden Circle going NE on Route 36 towards our first stop, Þingvellir National Park. Thingvellir National Park is the location of Iceland’s first Parliament, started back in 930 AD. At the Lögberg people could step forward and give speeches about important matters. An assembly of 48 chieftains gathered here to discuss laws & engage in court proceedings on behalf of the country’s citizens. 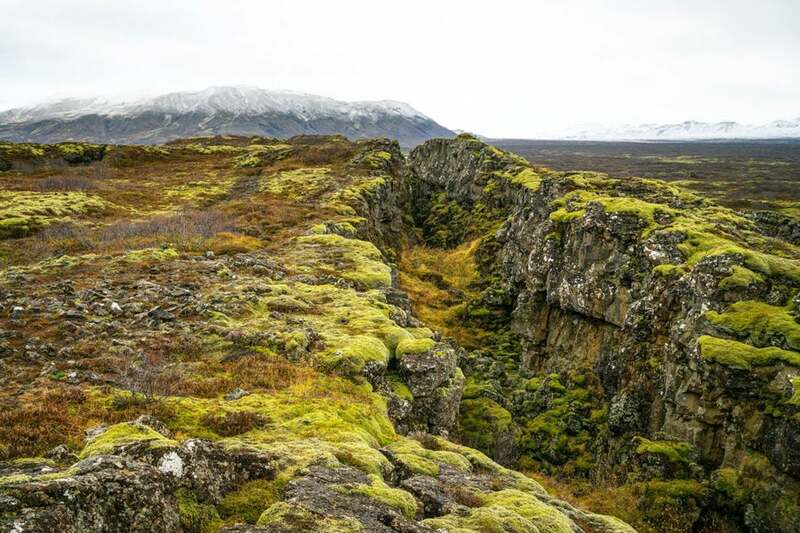 This is also where the North American & Eurasian tectonic plates are slowly splitting apart from each other, creating deep fissures in the ground. 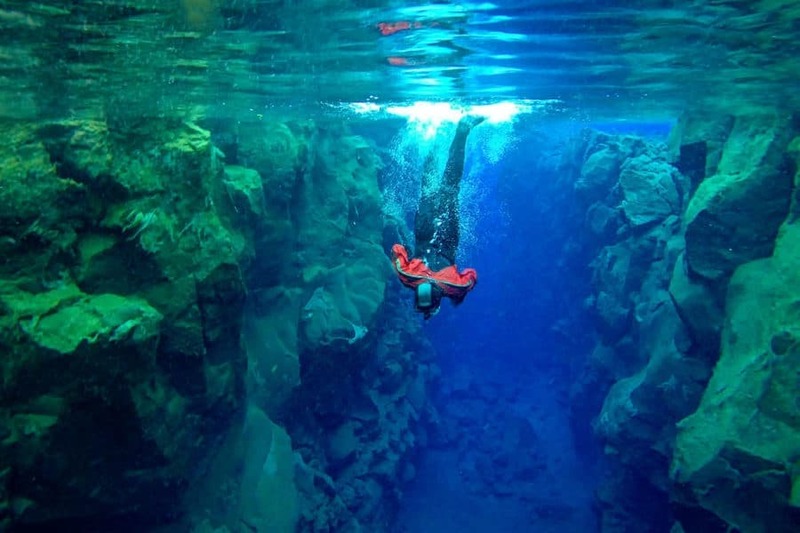 One of these, called Silfra, is full of icy glacier water where some people go snorkeling or scuba diving. A fresh snowfall dusted the mountains as we drove between beautiful valleys and large farms — with hardy Icelandic horses and sheep lining both sides of the road. The small fuzzy horses in Iceland may look like ponies, but don’t call them that in front of locals! Iceland’s horses have a long and proud history dating back to the 9th century. 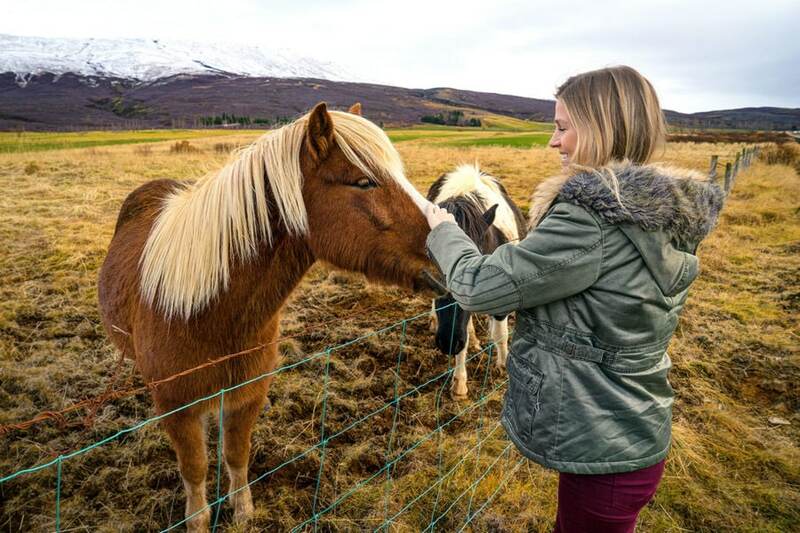 You’ll find many friendly horses on farms throughout Iceland. As long as you find a safe parking area to pull over (don’t stop on the edge of the road, it’s dangerous!) you can walk up to the fence and pet these guys. Don’t forget a horse-selfie! Next stop on our Golden Circle road trip was Haukadalur, a geothermal area about 60km away from Þingvellir National Park. There are two famous geysers here called Geysir and Strokkur. In fact, the general term “geyser” was actually named after this particular one in Iceland. 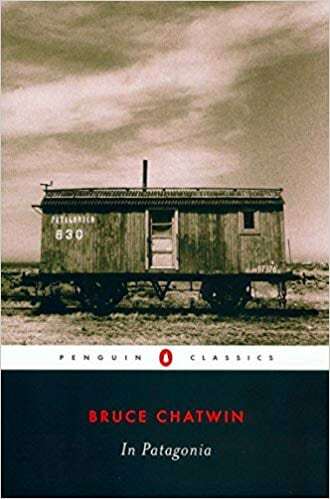 The Earth churns up boiling hot water that smells like rotten eggs, with steam rising from vents in the earth next to mud pools, fumaroles, and mineral deposits. 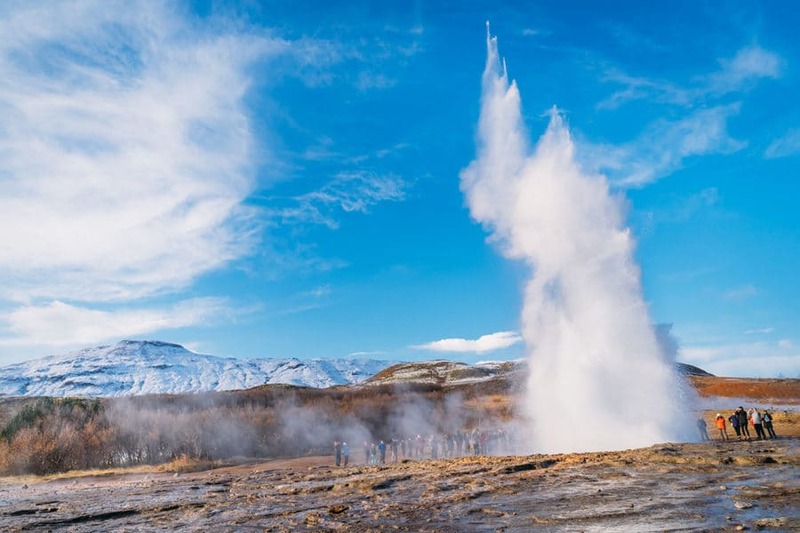 The original Geysir no longer erupts after an earthquake shut it down, but a second one called Strokkur constantly explodes with scalding water shooting 100 feet into the air every 10 minutes or so. Haukadalur has a restaurant/gift shop where you can warm up with hot soup. 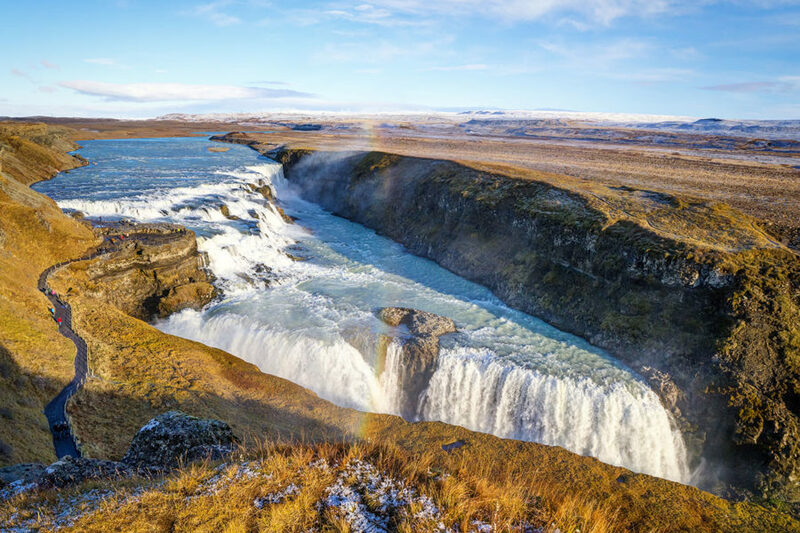 The mighty Hvítá river abruptly disappears into a ravine at a spectacular waterfall called Gullfoss, the next major highlight on Iceland’s Golden Circle. Gullfoss means “gold waterfall” in Icelandic, and when the sun hits it just right, it certainly fits the description! The wide & fast-moving river turns a corner and falls 100 feet into a crevice in the earth, producing thick mist & frequent rainbows. The dramatic scenery at Gullfoss makes it one of Iceland’s most popular attractions. After descending a long staircase from the parking lot, a concrete pathway allows visitors to walk along the edge and look down into the roaring cascade of water. Gullfoss waterfall is located off the main road, so you have to backtrack a bit to continue the normal Golden Circle route back to Reykjavik. Our final big stop on the Golden Circle was Kerid Crater Lake. We pulled into the parking lot as the sun was beginning to set on this red volcanic crater covered in green vegetation. Once a typical cone-shaped volcano, the top has since collapsed into an empty magma chamber. The bottom is filled with a deep blue shade of water that sets off the red & green colors on the crater itself. Hiking down to the bottom of the crater only takes 5 minutes. 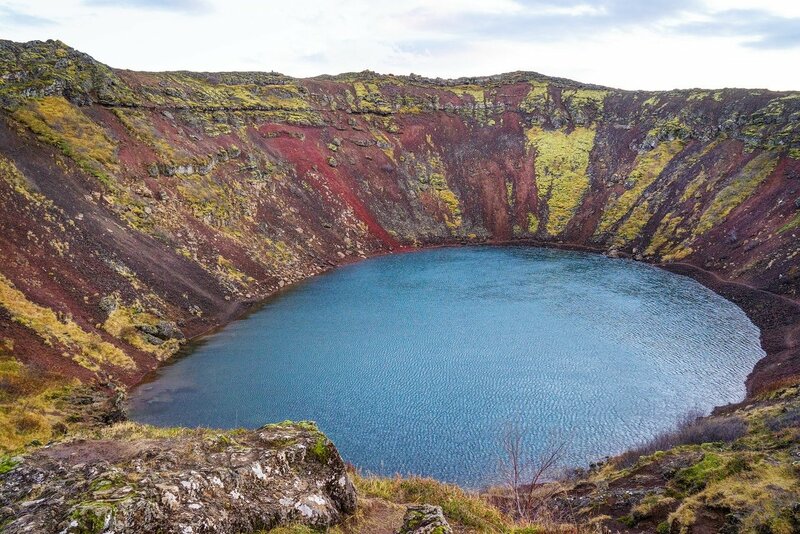 Not as well known as the other Golden Circle attractions, Kerid Crater is definitely worth a quick stop if you have the time. 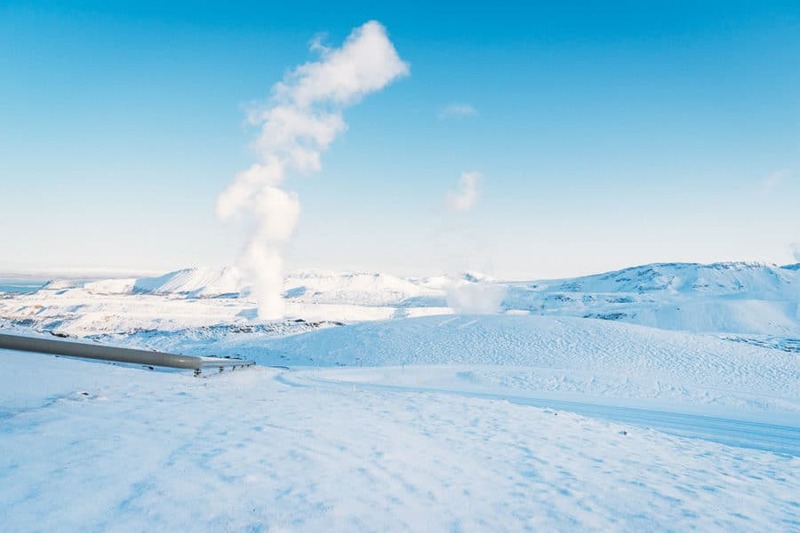 If you decide to drive the Golden Circle in a counterclockwise direction, starting at Kerio Crater Lake and ending in Þingvellir National Park, then there’s a beautiful backroad you can take to one of Iceland’s geothermal power plants. There is nothing special out there except the drive itself. A lonely road driving through pretty Icelandic landscapes. You can take this route right back to Reykjavik, and it’s a lot less busy than the normal way back. This route will add an extra 45 minutes to your trip, and the road can be covered in snow in the winter, as it was in October when we did the drive. It was pretty scary, and not recommended when covered with snow! There’s also a very cool luxury hotel out there called ION Adventure. It looks like a spaceship! 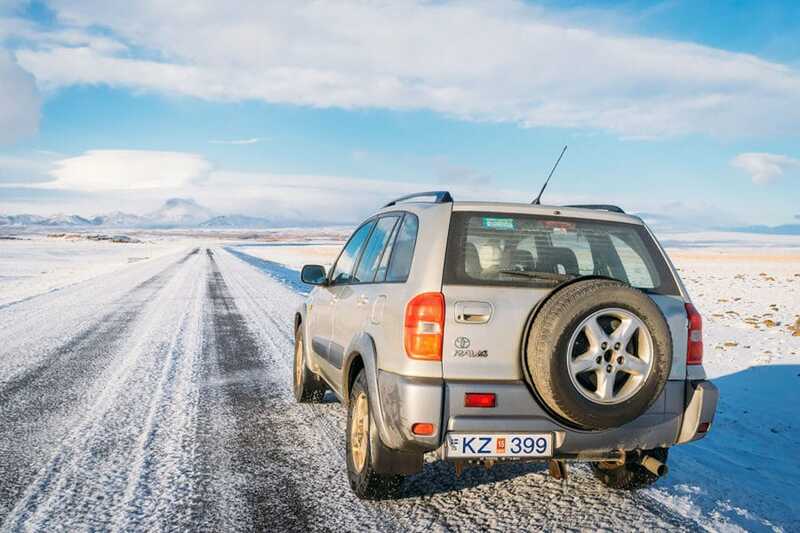 To reach Kerlingarfjoll, you need a 4X4 vehicle and the confidence to drive for 2-3 hours on Iceland’s F-Roads, rough jeep trails that go into the highlands. These roads are only open during the summer. It’s not possible to fit it into a day trip with the Golden Circle, you’d need to spend a night out there too. Either by camping or renting a mountain cabin. But it’s quite an adventure! Most people base themselves out of Reykjavik to drive the Golden Circle, as it’s a great day trip that can have you back in the city by evening to experience some of Iceland’s famous nightlife. But if you plan to continue to the Ring Road, the town of Selfoss is a good place to spend the night. Here are some great options for where to stay nearby. 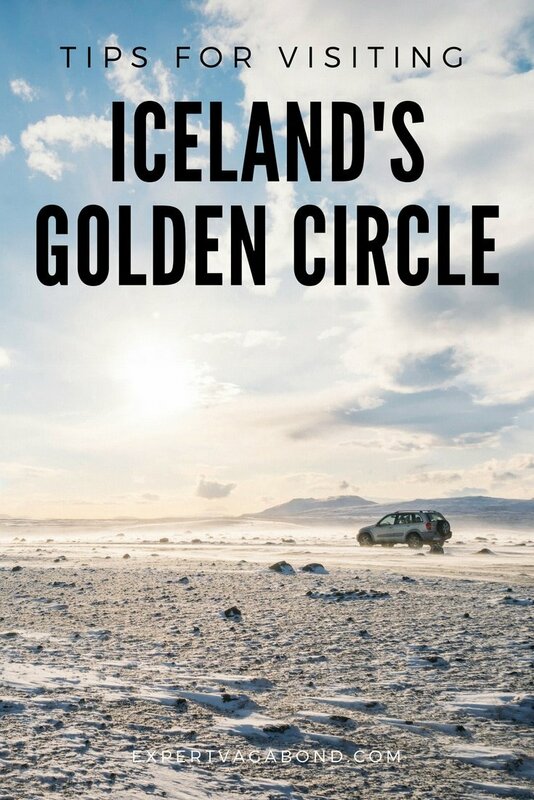 While technically driving the golden circle is only 3 hours round-trip, the reality is a 6-8 hour day depending on how long you spend at each stop. 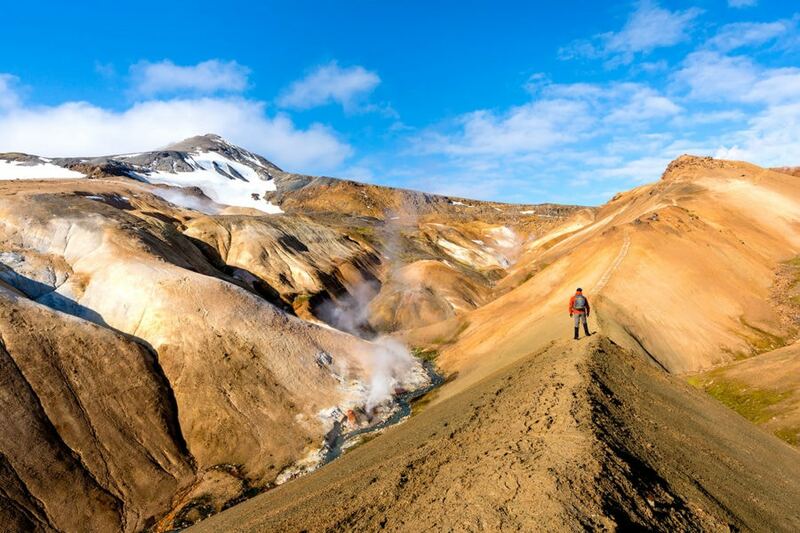 If you want to experience some of Iceland’s stunning landscapes but don’t have a lot of time (for example, a one-day layover), the Golden Circle is a wonderful option. The area around Gullfoss Waterfall gets pretty windy, so a waterproof jacket (and maybe even pants) is recommended if you plan to get close. The weather in Iceland can be unpredictable. We were visiting in October, and it started snowing at the beginning of our drive! Always pack warm layers no matter what season you’re visiting. Are you planning a trip to Iceland? Did you know about the Golden Circle? Drop me a message in the comments below!